Homepage. This page: A PC screensaver featuring period images of the Austin Seven motor-car. 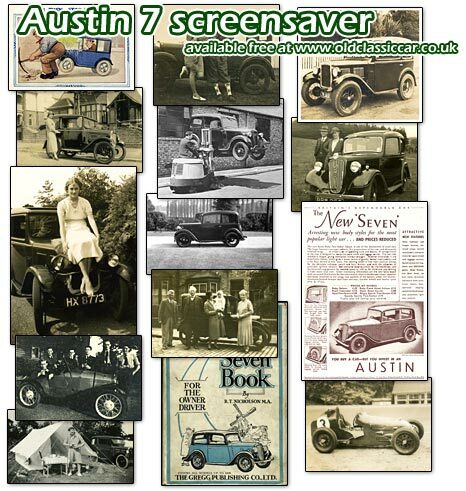 A PC screensaver featuring period Austin 7 images. There is quite a collection of vintage and classic car screensavers at oldclassiccar, some featuring cars, others different forms of classic transport. This one, added in 2009, contains images that all focus on the 'baby' Austin 7 of the 1920s and 1930s. The idea was to reflect the impact that this affordable little car had on Britain in the inter-war years, by only using period photos and images. Many of the old photographs show the cars with their lucky owners, at a time when car ownership was still not the norm, as it largely is today. No modern photographs were used (that would be too easy), all the Austin images that went into making this free screensaver are contemporary to the vehicle. Various types of Austin 7 such as the Ruby and earlier box saloon are included, as is a photo of a twin cam Austin racer, a scan of a period advert announcing the new Austin Ruby, and a humorous postcard inspired by the diminutive Austin. Most of the pictures are from my own collection, but thanks to Les, Hugh and Nigel for also helping out with pics from their own collections.